Well, we just returned from the Chicago show and now have a couple of months to recuperate. Our next show will be at the end of July in Newport and then in August we head off to Baltimore. As we get closer to these exhibits we will give you more information about times and tickets. Some good news may be on the horizon for those of us who are considered true experts. The Association of the Bar of the City of New York has recommended legislation that would amend NY’s Art and Cultural Affairs Law and would protect “authenticators in rendering independent, good-faith opinions about the authenticity, attribution and authorship of works of fine art.” The bill is designed to discourage frivolous lawsuits and if it passes, will give us some well needed protection. Over the past couple of years a number of authenticating bodies have disbanded because of the legal expenses they have incurred … these include those for Warhol and Basquiat. Well, looks like we lasted another month without the BIG CORRECTION … thank goodness! I do not need that kind of stress right now. It also seemed that we had another month of going nowhere … the closing number on April 1 was 16,532 and on April 30 it was 16,580. During the 21 trading days we saw an intraday low of 16,015 and a high of 16,631 … so for those of you who follow the market on an hourly basis there was some action, but for the new me (not watching it at all) it went nowhere. After checking my portfolio I realized, to my surprise, that many of my favorite stocks were up … here are the particulars: JP Morgan ($55.98 - down), Emerson ($68.18 - up), Exxon ($102.41 - up), GE ($26.89 - up), Berkshire B ($128.85 - up), AT&T ($35.70 – up), VOD ($37.96 - down), Verizon ($46.73 - down), Wal-Mart ($79.71 - up), Coke ($40.79 - up) and DuPont ($67.32 - up). So here was another month of no big overall point gain and my portfolio moving higher. I do hope this continues! Let’s begin with a small package that is just 3 ¼ inches high, but its price was astronomical. Let’s just say in a world where contemporary art dominates the art market, this tiny stone carving of a lioness, known as the Guennol Lioness, made in Mesopotamia 5000 years ago, roared proudly for ancient art, when it brought an overwhelming $57.2M (est. $14 -18M) including the commission. It holds the distinction of third highest amount paid for any sculpture at auction. Alberto Giacometti’s L’Homme qui marche and Jeff Koons Balloon Dog (Orange) hold the top record prices, but if you went for dollars per inch, as some of you like to do for paintings, the little lioness, blows the competition out of the water. Koons at $483k per inch, Giacometti comes in at $1.45M per inch and the Guennol Lioness measures in at $16.3M per inch….REALLY! The lioness dates back to the time when writing systems were being developed, the wheel was invented and cities were beginning to rise. Experts believe the statue would have been used to ward off evil, and most likely owned by a person of high social status. The Mesopotamians believed that power came by combining the physical attributes of different species. The lioness was consigned by Edith and Alastair Bradly Martin, who had originally bought it in 1948 from New York dealer, Joseph Brummer. Mr. Martin is a trustee of the Brooklyn Museum of Art, where the lioness resided, on loan, until the sale. There were 5 bidders battling it out and the successful purchaser only identified himself as an Englishman. Who knows where the little lioness is now. Another pint-size find recently made history, a 3.1 inch porcelain cup from the Chengua-era (1465-1487) sold for $36.1M with the commission (est. upon request). And if you want to know it’s per inch value, that’s about $11.6M per inch. Supposedly there are only 17 of these doucai, or better known as chicken cups, that are believed to still be in existence, and only 4 are in private collections. The cup got its nickname from the depiction of a rooster, his hen and their chicks; a representation of the emperor, the empress and his subjects. This cup is thought to have been used by by the Chinghua Emperor himself. Really?? The stone was graded by the Gemological Institute of America as a Type IIa pink diamond (very rare) and is considered ‘potentially flawless.’ The style of the cutting is most often associated with a white diamond and when found in rare colors like pink and blue, it becomes very highly sought after by collectors. Furthermore, this diamond had not been on the open market for about 60 years, since it had been bought from Harry Winston. Now some of you may have heard that this past November another pink diamond, called the Pink Star, weighing 59.60 carats, was sold for SFr 76.3m ($82.06M)…a little more than the Graff Pink, giving it the distinction of holding the auction record, but I no longer think it qualifies. Just recently (February 2014), the winning bidder defaulted on the payment. The auction house (Sotheby’s) now owns that little gem and considers it a good investment. Is that what we are calling a sale that goes south…an investment? Really!? It has already been a month since this sale took place (it just missed our last newsletter) but the results were so unbelievable that we had to go back and cover this one. The George D. Horst Collection of Fine Art auction at Freeman’s on March 30th featured a slew of fresh to the market European and American works of art. Included were works by Corot, Boudin, Hassam and Redfield. The final lot of the sale, Redfield’s Winter Sunlight, took the top spot of the day. With a fairly conservative estimate of $200-300K, the bidding finally stopped at $710,500! Taking second was Marshes of Long Point, by Frank Weston Benson, selling for over $662K on an estimate of $200-300K. Rounding out the top three was Emil Carlsen’s Copper and Porcelain, a still life of…. I bet you can’t guess. The work ultimately sold for just over $386K on an estimate of $100-150K. See the two tiny slivers of blue and orange? Well, the blue is our one withdrawn lot and the orange represents the TWO lots that actually sold within their estimate range. Now, either the person in charge of determining the pre-sale estimates needs a refresher course on the market or they intentionally published very weak estimates. My guess is they dropped the estimates to garner more interest in the sale with the hopes that there would be more bidders and once you’re bidding… well hey, it’s just human nature to want to win. If that is what happened, the scheme worked, and it worked damn well. The published pre-sale estimate was $1.3-1.9M. Any guess what the sale actually totaled? $4.34M, more than double the high end of the estimate range. Now, don’t get me wrong, Freeman’s did absolutely nothing immoral here, the bottom line is it was just incredibly interesting to see how it all played out. Oh, one more important factor did come into play … all the works had been in this collection since the early part of the 20th century so they were, as I stated earlier, FRESH TO THE MARKET! The Orientalist sale in London on April 8th garnered strong results. 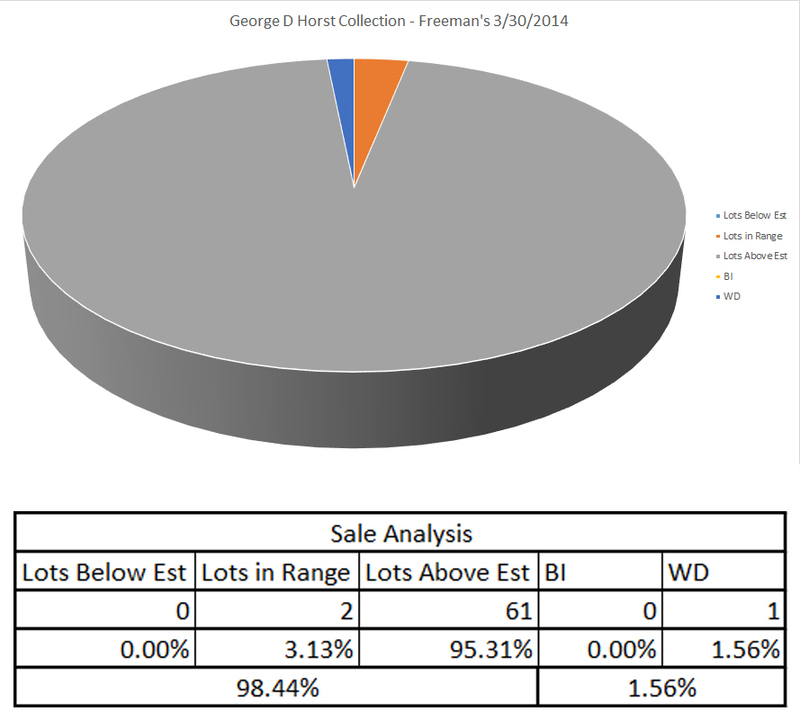 Out of 39 works offered 33 sold (84.6%); most of them over their pre-sale high estimates. In total, the sale brought in £4.83M ($8.1M), just above the low end of the presale estimate - £4.2M ($7.1M). You might be wondering: how is that a strong result? I’ll explain later. Jean-Leon Gerome’s Bashi-Bazouk, oil on canvas came in as the fifth most expensive lot in the sale. Over the course of his career, Gerome painted many Bashi-Bazouk’s. These men were irregular soldiers of the Ottoman army, notorious for being brutal and undisciplined – Bashi-Bazouk literally translates to “damaged heads.” This work was offered by Sotheby’s in 2009 with a $600-$800K estimate but BI-ed. This time around they lowered the estimate drastically to £180-£250K ($300-$420K) and it sold for £219K ($367K). Carlo Bossoli’s The Ciragan Palace, Topkapi Beyond, tempera on linen canvas had an estimate of £200–£300K and brought in £315K ($529K) came in at number four. It was bought by a collector directly from the artist for 100 francs and has remained in the family’s possession until now. Three Rudolf Ernst were sold in this sale all within the top eight lots. His Prayers at Sunrise with an estimate of £100- £150K fetched £339K ($569K) – it was number three. This work was first hung in Brooklyn Paramount Theater and sold by Sotheby’s in 1974 for £2,974. This time around an Institution snagged the work. It was very common for an Orientalist artist to depict scenes of prayer. Ernst however, shows the spiritual moment in this work as an almost “time-line” of the ritual. Each figure is in a different pose, the takhbir (facing mecca with his hands raised to God), the sujud (sitting upright at the moment of reflection before placing forehead to the ground) and a third figure rolling up his carpet signifying the completion of his prayer. If you are unfamiliar with the culture this may not seem unrealistic to you but in the Muslim culture all worshippers will do the different stages of prayer together. The runner up for this sale was Mahmoud Mokhtar’s bronze Au Bord du Nil (On the banks of the Nile). With an estimate of £50 -£70K this sculpture brought in a whopping £459K ($771K). Not only did the selling price soar over the high estimate but this was a record for the artist at auction as well as the world record for an Egyptian sculptor at auction. According to the catalogue, Au Bord du Nil represents the peasant women (fellaha) who became the iconic emblem of Egypt’s revolutionary movement in the early 20th century. The sculpture depicts a modern peasant while reflecting back to the past poses of Egyptian queens symbolizing ancient and modern Egypt simultaneously. The leading lot for this sale was a work by Etienne Dinet. Dinet was born in France in 1861; his passion for the Muslim culture led him to immerse himself directly into their lifestyles. He moved to Algeria in 1884 where he learned to speak fluent Arabic and by 1913 he converted to Islam; even changing his given name to Nasreddin, meaning “Defender of the Faith.” The work offered in this sale, Conciliabule dans la nuit (The Night Conspirators), oil on canvas had an estimate of £400– £600K and sold for £783K ($1.32M). This piece was first bought in Algeria from the artist and was put up for sale by the descendent of the owner. In addition, this is the first time the work has been on display to the public since it was shown at the 1924 Algiers exhibition. Artists who beat their current auction records during this sale include, George Henry Laporte, Ferencz Eizenhut, Joseph Caraud and Luise-Emile Pinelde Grandchamp. So… I said the sale had strong results yet it made only £600K over the low estimate…how is that strong? Well, three of the lots that did not sell were BIGGIES. David Roberts, The Bazaar of the Coppersmiths, Cairo, had an estimate of £600–£800K. This work was commissioned from the artist in 1842 for £210 including the frame. What an appreciation in value – given the estimate. Another BIG work that did not find a new home was Ludwig Deutsch’s The Procession of the Mahmal through the Streets of Cairo. With an estimate of £1M-£1.5M, if this work sold, it would have greatly changed the overall sale results. What I can say is that this work was oversized (112 x 116 inches) and not the typical finely detailed work the artist is known for. Lastly, the final BIG work that did not sell was Etienne Dinet’s Jeunes Filles a leur toilette (estimate £250–£350K). These three lots accounted for £1.85M of the presale estimate and since I did not physically see the works, I cannot tell you why … maybe the estimates were just too high or there were other issues. Also contributing to my conclusion that the sale was very strong is the fact that 23 of the sold lots made more than their high estimate, 9 were in the range, 1 sold below and new auction records were set for five artists and a world record auction price for an Egyptian sculptor. So, if we discount the three big unsold lots and consider the strength of all the other works, I’d say the Orientalists are on the rise! 19th Century – Where Are the Paintings? As I have been saying, there seems to be a real shortage of high quality, good condition, works of art coming to the auction block in the 19th century arena. At the end of April, Christie’s New York presented their offerings and once again, not much in the way of really good art. That is not to say there weren’t some interesting works, but the pickings were slim – as you will see. Taking the top slot in this sale was a Courbet that carried an $800-$1.2M estimate and sold for $700K ($845K with the commission) … this particular work did not blow me away and from the result, it did not blow most people away … probably one person bidding against the reserve. In second place was Bouguereau’s 1893 Reverie sur le seuil at $400K ($485K with commission … est. $500-$700K). Here again I was not impressed; if you wanted a Bouguereau painting, you could have one --- but it was not a great one (had a fair bit of surface cracking) and the lack of action on the bidding side drives home the point. In third place we had a tie: a small J.F. Millet (est. $300-$500K) and a del Campo ($220-$300K) … both sold for $300K ($365K with commission). I wasn’t a big fan of the Millet, but I did like the del Campo. There were some other nice works and most of those did rather well: Bridgman’s Women at the Fountain made $190K ($233K with commissions – est. $150-$250K); Pasini’s Market Day… brought $200K ($245K with commissions – est. $200-$300K) and there was a bidding war for Dawson’s Engagement between Mediator and three French and two American Ships – the work was estimated to bring $70-$100K and sold for $290K ($353K with commission). Among the pricier works that failed to find buyers were: Sorolla’s El beso (est. $600-$900K) … a little too sketchy for my taste and not one of those classic beach scenes; Beraud’s Le boulevard St. Denis a Paris (est. $500-$700K) … not a very strong example – colors were a little weak; de Schryver’s The Little Flower Seller… (est. $200-$300K) … condition plagued this one; and Corot’s Clair de lune sur les eaux (est. $200-$300K) … again, condition concerns and just way too dark – this work last sold in 2004 for $247,700 and was offered in 2013 with an estimate of $300-$500K and did not sell. When the sale was over, of the 70 works offered, 48 sold (68.5%) and the total take was just $4.8M (low end of the estimate range was $5.6M) … so even with the buyer’s commissions added in, they were well short. As you can see from the results there were no million dollar works of art being offered and most of the sold lots were under $100,000. I decided to break down the sale even further (numbers are based on the hammer prices): 17 works sold for $25K or less, 15 sold in the $25.1-$50K range, 7 in the $50.1-$100K range, 8 over $100K … with 1 selling in excess of $500K. The top 10 lots (actually top 11 since the number 10 spot had a tie) in this sale accounted for $3.35M (with the buyer’s commissions); or 69.6% of the total sale. Look, there is very little the auction room can do if great works are not coming to the auction market at this time. Gallery Updates: I am pleased to report that we will be in the gallery for the next 2 ½ months; so stop by for a visit if you are in the area. Web Site Updates: This month more than 21 contemporary and 19th century paintings and drawings found new homes … among them were works by Hoeniger, Percy, Aston Knight, Brunery, Monchablon, 3 by John Stobart, Dunkel, Waichulis, Casey, Brady, Steel, Hirst, Garlick, Judd, Rodriguez, Martinez, Dillon, Rosario and Reynolds. In addition, we have added a number of new pieces to the web site. Next Month: The BIG ONES!